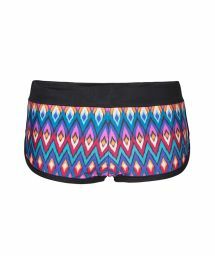 Bikini shorts is a must have for summer season! This built-up bikini available in latest patterns and colors on our website will make your time on the beach active, fun and comfortable! Are you ready for summer sports and beach time? Do you have a pair of boy short for women? These will allow you not only comfortably laydown on the beach but also practice summer sports such as surfing, beach volley, jogging by the sea and many others! They are more built-up than typical bikini that’s why you may feel comfortable and be sure that the shorts bikini covers well your down parts perfectly! Choose one of our models and enjoy the beach. On our website you will find many models in different colors and shades, in top cuts and latest prints! You may choose between sporty models i.e. surf style as well as romantic crochet shorts bikini. It all depends on your mood and preferences! The variety of our offer, top quality and trendy patterns guarantee your satisfaction and best choice. Black shorty swimwear with South American vibes? Check out our collection and find beautiful, high quality top collection of black shorty bikini and you will not want anything else! Black shorty swimwear on Brazilian Bikini Shop has this fun and cheerful South American vibe. If you want to know why check out our new collection from top Brazilian brands and you will see what we are talking about. Black boyshort has one big advantage on other cuts: it is very comfortable, ensures confidence and a lot of fun on the beach. You can easily practice sports both on the beach and in water such as fresco ball or surfing and be sure that your bottom part is well covered by the bikini bottom. “Made in Brazil” tag also guarantees that shorts are very feminine and you bottom will look great in it! They are designed in a way to highlight the beauty of the women bodies. So get one yourself and run enjoy all summer activities you want!